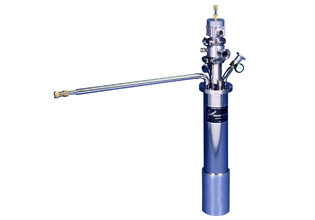 The Janis Research Company customized model STVP cryostat is a versatile research tool, designed to operate between 5 K and 600 K. The sample itself is located in an inert, dry, static exchange gas, (e.g. helium), which ensures that the sample is not affected by exposure to cryogen vapor. Operates from 5 K to 600 K using LHe and from 78 K to 600 K using LN2. The sample is located in a static thermal exchange gas (e.g. dry helium). This provides repeatable tests on materials that otherwise could be affected by contact with cryogen vapor in flowing vapor type systems. Sample holders use guard ring techniques to reject "fringing" effects at the edge of the sample. High and low impedance materials samples can be accurately tested using two / four terminal sample connections. Fast and accurate temperature settling using a dual channel temperature controller (separately controls the main and sample heaters). The system operates with continuous flow of cryogen via a transfer line from the dewar. The unique flexibility of being able to switch between LN2 and LHe ensures that this high performance cryostat system will fit your requirements, now and in the future. The 129610A cryostat may be used together with any Solartron materials test system to run I-V, Pulse, C-V, Impedance, Mott-Schottky and a wide range of other materials test techniques, fully integrated with temperature control. High and low impedance materials can be analyzed depending on the choice of instrumentation. - Compatibility with LN2 dewars that are not supplied as part of the system cannot be guaranteed. - or equivalent is needed for system operation. Sample measurement Uses guard ring techniques to reduce errors due to "fringing"
System Compatibility The model 129610A Cryostat is fully compatible with all Solartron Analytical materials test systems.